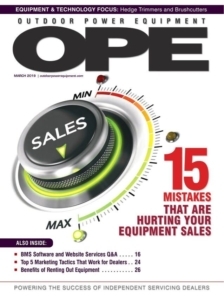 Arlington, Texas, April 10, 2019 – c-Systems Software Inc., a leading industry-specific dealership software vendor in North America, is pleased to announce that its General Manager, Ajay Thakur, has recently participated in a Business Management System Software and Website Services Q&A for Outdoor Power Equipment (OPE) magazine. In the Q&A, Thakur discusses the company’s current trajectory and latest industry trends. He also addresses the fact that Constellation Software Inc. acquired c-Systems in 2018, meaning that it now owns two of the biggest software vendors in the OPE industry, including c-Systems’ long-time competitor, Ideal Computer Systems. In addition, Thakur talks about the release of Ideal’s new Dealer Insight Report & Trends (DIRT) tool, which allows dealers to measure their business performance and see how they compare to their peers across the country. To learn more about DIRT, visit https://customer.idealcomputersystems.com/dealer-insight-report-trends-tool/. Thakur states that the biggest focus for both c-Systems and Ideal is on mobile applications and analytics tools like DIRT. 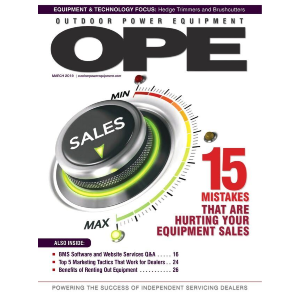 To get more answers from Ajay Thakur, be sure to check out page 16 of the March 2019 issue of Outdoor Power Equipment (OPE) magazine. c-Systems Software Inc. is a business management solution vendor for outdoor power equipment, agricultural and powersports dealers. It’s tough to keep every single dealership process, department and employee in check when there are so many of them. That’s why c-Systems created one system to manage it all, so that dealers can stop fussing about the little things and focus on the big picture. Acquired by Constellation Software Inc. in 2018, c-Systems continues to provide the specialization and individual attention dealers expect from a family-oriented company, while benefitting from the stability and support of an organization with over 20,000 customers worldwide.